from blank pages...: Exploring Creativity: My First Alphabet summed up! + SALE! Exploring Creativity: My First Alphabet summed up! + SALE! 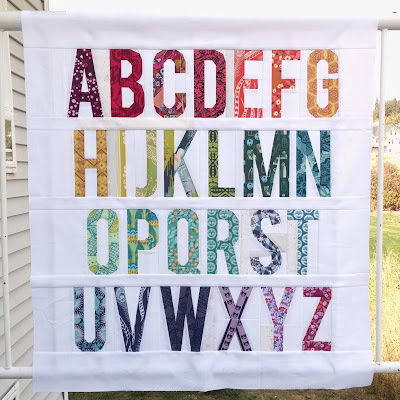 I have been wanting to make an alphabet mini ever since I made this pattern. It just hasn't ever happened, until now! I couldn't resist using the 6 inch alphabet pattern to make these!! SO fun! I think I like the 6 inch pattern even more than the 3 inch pattern... though I don't think I can really say that and be honest. They both have their place. All prints are by Anna Maria Horner. I used kona cotton white for the background, but through in some random low volume prints (cotton + steel, Lizzy House, Karen Lewis. I love how it turned out and can't wait to get this quilted up! With this project I tried really hard to get the rainbow just perfect. Though what I really learned from this was to let go and just let it happen. I tend to be a control freak, but as I was assembling the Love is Made of Hearts quilt, it was so liberating to join all of these random blocks together and see how completely perfect it turned out!! There is no way I could have made it any better. 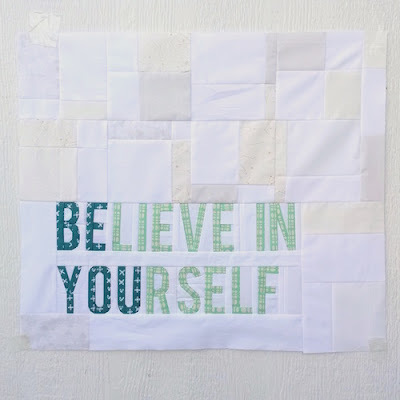 That process taught me a lot about using the different variations of the prints and colors to add interest and beauty to the quilt, rather than seeing those as imperfections. I'll call it the journey of scrappiness. The second top I made is this one I drew up in orange and blue. I did like it in the colors that I originally saw it in, but I'm glad I changed it. Especially since copying someone else doesn't entail much exploration or creativity. lol. I used this project to help me fine tune my own style and what I like, and help me figure out where I want to go with my own unique style. I used colors that I love, and decided to copy this disappearing 9-patch design that I used in this mini quilt - which I was really surprised at how much I love it! I am going to do matchstick quilting on this quilt - with the lines super close together. It takes forever, but I LOVE the finished result. And of course I love the message of this quote. What I take from it is how important it is that I am myself. Completely and entirely me. And only when I am ME, can I truly believe in myself. The two are inseparable, and I think integrity, personal integrity, is a big HUGE part of that. Otherwise that belief can't be anchored, because without that integrity, what you're attempting to believe in isn't real. And there isn't anything to anchor to in the first place. So to me it's a beautiful message of purity, freedom, and strength. P.s. I have to add, that my husband loves me so much!! He removed all of the paper off of both of these projects for me!! I am totally spoiled! ;) Thank you Mr. Bohn! You're the best! What did you learn and experience this month? Did you find growth and direction as you worked on your projects, or even just planned or dreamed about what you would make? Let's end with some awesome sauce news!!! Since I made a 6 inch pattern for the letters, of course I had to make a 6 inch version of the numbers and punctuation marks too!! Now available in 6 inches tall! Perfect companion to the 6 inch tall letters! If you subscribe to my newsletter.... make sure you check your inbox later tonight!!! Hint, hint! And of course don't forget to read the newsletter from Saturday night to see the winning quilt for this month!! Not signed up? You can sign up HERE. P.s. Don't forget to come back tomorrow to find out October's pattern! !